First you’ll notice Lottery Club’s dark and clean design. The grey and yellow color scheme is beautiful and pleasant. On a second look, you’ll find many similarities with other Lottoyard operated online lottery carriers such as Icelotto Fortunately, Lottery Club is raising the bar for other and gives a nice overall experience wrapping the platform’s features with a good looking user interface. Opening an account with a lottery carrier require providing personal details – an action based on trust. Does Lottery Club take affirmative action in assuring it’s player’s security? Lottery platforms come with a set of potential products of which the carrier chose what to offer its players. What products Lottery Club has on the shelf and how well are they serving players? With products comes available features. Not all relevant, some just get in the way of players in need. Which features are up and how do they contribute to players’ experience on the site? With multiple screens and platforms, comes multiple support – devices, operating systems, etc. Using different devices might require a tailored experience matching the need. How does Lottery Club meet the challenge? 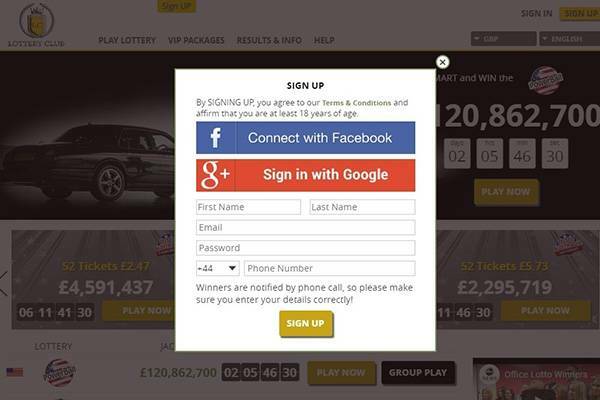 The online lottery industry is aligning with offers and promotions designed to attract players. Discounts on multiple lines of multiple draws reward players with a bonus, and so does VIP programs. What Lottery Club has to offer? Usually relevant only when something goes wrong, and this is why Customer Support should be taken to consideration. Availability hours, channels Lottery Club is reachable on, etc. Are they’re there when players need them? At the top of the list as it’s the highest in importance. Lottery player’s security needs is something all lottery carriers must meet. Lottery Club is using a secured connection (HTTPS protocol) that encrypts the communication between the lottery players and this carrier. Certification is issued by GeoTrust Global. Another benefit of having a valid certificate is it require identifying the site’s owner, which in this case proved to be a little odd as the owner only identifies with the site’s name and the legal entity listed in the site’s footer is set there as an image (a practice used to “hide” information from search engine crawlers). This is not yet a red flag, but something to keep track of and address Lottery Club’s customer support. Google’s algorithm samples billions of sites each day in the search for abusive ones. A check using their tool resulted in a not dangerous status – good news for Lottery Club players. Google has found no malicious intent examining the site. Lottery Club are showcasing a number of trust icons and certificates, but they mean nothing as not backed by trust worthy services. A search on Trust Pilot came up empty as there are no reviews – this is often a good indicator as most user would take the time to complain, but not to compliment. Secured encryption is an industry must as players are asked for personal details and complete a lottery ticked purchase by processing a personal payment method online, and this is something Lottery Club provide – a safe gaming environment. There is one raised flag, that might not mean anything, as there’s no information about the company supposedly behind the site – Messenger Tech Ltd.. On the other hand, a reasonable search didn’t turn up any user complaints. Lottery Club seem to be a legitimate online lottery carrier. 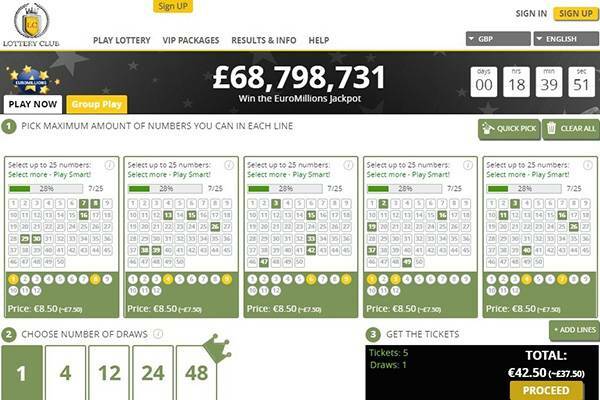 Lottery Club is making use of Lottoyard’s platform, that is sure, even if not specifically stated. This is a solid platform servicing many lottery carriers. It has a verity of products and services for Lottery Club to offer it’s players. This is what lottery carriers are all about – giving it’s players the option of buying a lottery line of lotteries from around the world. A player purchasing a winning line will be entitles to it’s full prize (minus taxes if relevant). On a line is purchased, the ticked is scanned and available on the account view on the site. There are twelve lotteries offered: SuperEnalotto, PowerBall, MegaMillions, OZ Lotto, EuroJackpot, Lotto 649, UK Lotto, ElGordo, NewYourkLotto, LaPrimitiva, EuroMillions, and BonoLoto. This is the first iteration of the single lottery line – one share (=1/150) of a pool of 50 lottery lines. For a fraction of the cost a player has a better chance of x50 for getting a win. A share means any reward is divided by shareholders, and for this reason this product is mostly for those who enjoy the play and want to make their money last as long as possible. All offered lotteries has the option of syndicate share. Not something all carriers offer. This is where Lottoyard’s platform’s benefits comes to play. Bundles are great as players can complete a purchase of American or European lotteries shares. This product is reserved for those who want to go BIG. It allows pre-purchasing lottery lines of the highest jackpot. It means players always play for the current biggest prize, no matter what lottery provides it. 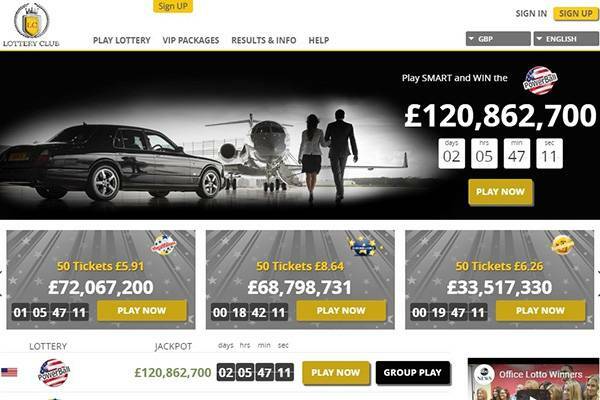 Lottery Club implemented Lottoyard’s platform best products. The verity is complete and will answer almost any player’s needs and wants. No need to go elsewhere. Looking harder, there one thing to improve. And that’s the number of lotteries offered, while good selection of top lotteries, there are others and also raffles. While products answer a player’s need, the features contribute to an overall experience, as they make the path throughout the site smooth and intuitive. With each personal and syndicate purchase there’s the option of completing a multi draw purchase and thus participating in future consecutive draws. Options are between 2 and 52 multiple draws. This means not skipping draws, and just checking in for results and winnings. An obvious nest step to multi draw is a subscription – completing an ongoing purchase of a specific product. Payment is charged in intervals to keep playing the same product until said otherwise. One click on Auto Pick button will automatically generate the numbers for one line. It’s a basic feature, but poorly implemented. Would be much better if players could pick some numbers and clicking the button would auto fill the missing ones for a complete lottery line, but as it is now, each click auto picks the whole line, overriding user’s picks. Not adopted by enough carriers this feature is taken for the world of e-commerce. It provides a player with the ability of completing a one purchase (financial transaction) of multiple products. It basically makes the purchase process simpler for players who buy more than one product. There’s also many editing options from within the checkout page that are derived from this feature. Great line of features contributing to a positive user experience. There are a couple missing, but it’s truly unnoticeable for those who are not familiar with them – Quick Pick a certain number of lines should be the next to be used. Lottery Club passed this review successfully. Connected users expect services to be available at all times, accept all payment methods, and provide a rich experience on any screen. Having the ability to consume lottery through any available device is key. These days the requirement is even more strict, not only support different platforms but Taylor for the relevant usage. Site looks great on desktop, but content is narrow in comparison to more modern gaming sites. Hopefully, the lottery industry will align with more veteran services and make better use of desktop screen sizes. Interface is simple and clear making navigation throughout the site familiar. Tablet is showing a narrow version of desktop view. Unfortunately, the site is not responsively built and designed and so the tablet is lacking, to say the least. Images are cut, menu is missing elements, content is broken – in short, a very bad experience. There really is nothing positive to say about Lottery Club over tablet – avoid. 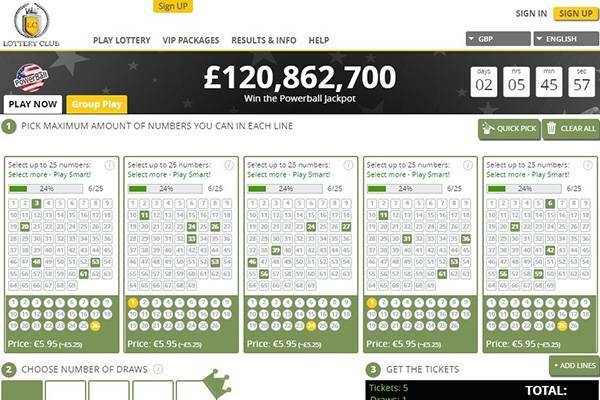 Lottery Club has a dedicated view for mobile, which is an improvement in comparison to tablet. First impression is far from nice, design seems amateurish – spacing is an issue, images stretch and lose shape, and other small visual misshapes. On the plus size, there are direct links to Personal line and Group share of each lottery, and all bundles and special products are showing at the homepage. Footer details are missing, and some of the links are missing altogether. While desktop support is satisfactory, tablet is unacceptable, and mobile is decent. Tablet view should be addressed ASAP, and mobile could really use rethinking – user usage, what to place where, and other improvements. An app would also do players some good, but can wait for more urgent issues to be addressed. In short, players can enjoy Lottery Club’s service on desktop and mobile, but not on tablet. Just as with security, customer support is very important for players to know there’s a mean for reaching the carrier in case of… whatever. There’s an English live chat available Monday to Friday, 9 AM to 5 PM (GMT). Over the weekend support would be much better, and multi language support is also a nice to have option. Strong point for Lottery Club as there are multiple numbers, each dealing with a specific service – support, customer relations, verification, etc. Phone lines are open same as live chat – Monday to Friday, 9 AM to 5 PM (GMT). Direct email address for customer support is published- support@lotteryclub.com – and any message should be replied within 24 hours. Not sure how this correlates with working hours. There’s a popup with a contact form when the live chat is unavailable. This is a good practice so players are not left on the site with no action to take. Multiple contact means allowing reaching Lottery Club are a very good signal for seriousness of carrier. This availability is crucial for players as they should never wait too long for an answer or a solution. Lottery Club does more things right than wrong. Customer support, products, and features are contributing to a very enjoyable experience. Promotions are meeting the standard. Not finding information on the company that owns the site is a raised flag, but just something to mind. There were no complaints from frustrated players on review sites and forums. For the time being, Lottery Club get an all clear sign from Top10bestonlinelotto!